Add 1 can of Cream of Mushroom Soup, 1/2 Can of water, and 1 Chop to the Crockpot. Cook for 3-4 hours until pork shreds or Bake at 325 for 45-60 minutes until done. Place rack in the lower third of the oven. Place ham in a shallow baking pan. Bake 10-12 minutes per pound or until internal temperature reaches 155-160 degrees. If you are glazing the ham, remove the ham 45 minutes before done, score the top of the ham with a sharp knife, cutting through the ham around 1/16 of an inch. Brush the ham with the glaze of your choice and return to the oven and finish baking. Preheat oven to 325 degrees. Bake ham for 10-12 minutes per pound. Place Chicken Cordon Bleu in a baking dish. Cover and bake 45 minutes, then take the foil off and bake for another 10 minutes. Make sure the internal temperature of the chicken on serving is 160 degrees or higher (check with a meat thermometer). Try topping with alfredo sauce before serving. Another Option: Turn Cordon Bleu upside down. Stick toothpicks into sides to seal cheese and ham inside the chicken, and then bake. Place Chicken Mexicano in a baking dish. Cover and bake 45 minutes, take off foil and bake for another 10 minutes. on serving, make sure internal temperature of the chicken is 160 degrees or higher (check with a meat thermometer). Try topping with salsa verde when done. Combine garlic, salt, and pepper or your favorite seasoning and rub over the roast. Place the roast bone-side down in a shallow baking pan. The bones act as a natural rack. Roast for 15 minutes. Reduce oven temperature to 325 degrees. 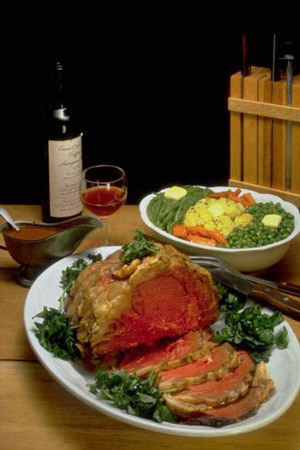 Roast 20 minutes per pound or until internal temperature reaches 120-130 for rare or 135-145 for medium. Serve with Horseradish on the side. Or try creamy horseradish: Add equal parts sour cream and horseradish and a touch of salt. Stir.